10. Let Which of the following statements is (are) true? x = 3 − 2sint and y = 2cos t − 1. 20. 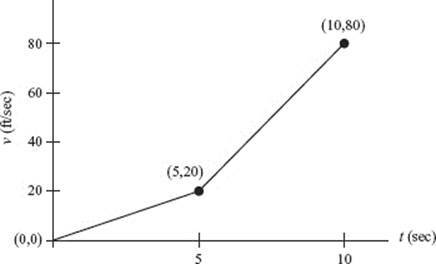 Which of the following statements about the graph of is (are) true? I. 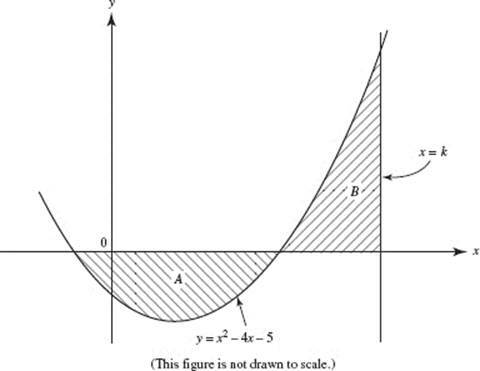 The graph has no horizontal asymptote. II. 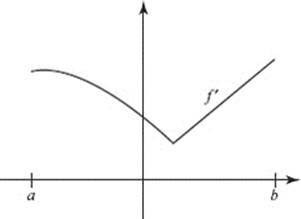 The line x = 2 is a vertical asymptote. III. 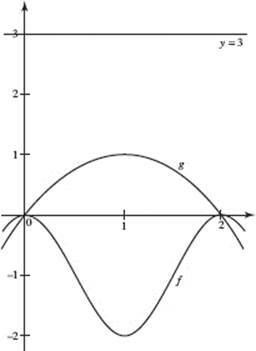 The line y = x + 2 is an oblique asymptote. 23. 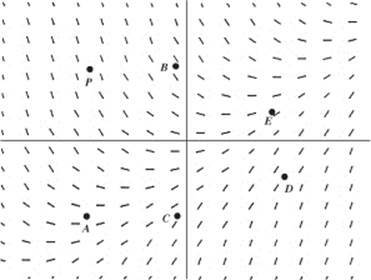 A cylindrical tank, shown in the figure above, is partially full of water at time t = 0, when more water begins flowing in at a constant rate. The tank becomes half full when t = 4, and is completely full when t = 12. Let h represent the height of the water at time t. During which interval is increasing? I. f is defined at x = 6. III. f is continuous at x = 6. 29. Two objects in motion from t = 0 to t = 3 seconds have positions x1(t) = cos (t2 + 1) and respectively. How many times during the 3 seconds do the objects have the same velocity? 31. Where, in the first quadrant, does the rose r = sin 3θ have a vertical tangent? 32. A cup of coffee placed on a table cools at a rate of per minute, where H represents the temperature of the coffee and t is time in minutes. If the coffee was at 120° F initially, what will its temperature be 10 minutes later? 37. An object in motion in the plane has acceleration vector for 0 t 5. It is at rest when t = 0. What is the maximum speed it attains? (B) If f ′(c) = 0, then f has a local maximum or minimum at (c,f (c)). 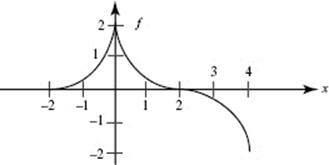 (C) If f ′(c) = 0, then the graph of f has an inflection point at (c,f (c)). (E) If f is continuous on (a, b), then f maintains a maximum value on (a, b). 44. The graph of f ′ is shown above. Which statements about f must be true for a <x < b ? (a) Write the parametric equations for the location of the ball t seconds after it has been hit. (b) At what elevation does the ball hit the wall? (c) How fast is the ball traveling when it hits the wall? (b) Estimate the average depth of the water, in feet, over the time interval 0 ≤ t ≤ 24 hours by using a trapezoidal approximation with subintervals of length Δt = 4 hours. 4. Two autos, P and Q, start from the same point and race along a straight road for 10 seconds. The velocity of P is given by feet per second. 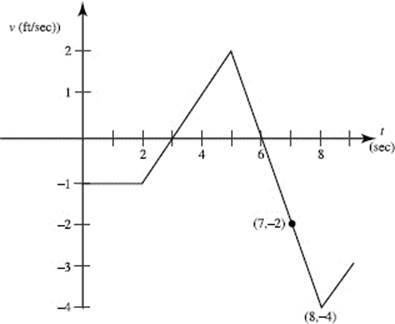 The velocity of Q is shown in the graph. 5. Given that a function f is continuous and differentiable throughout its domain, and that f (5) = 2, f ′(5) = −2, f ″(5) = −1, and f ″′(5) = 6. (a) Write a Taylor polynomial of degree 3 that approximates f around x = 5. (b) Use your answer to estimate f (5.1). (c) Let g(x) = f (2x + 5). Write a cubic Maclaurin polynomial approximation for g.
(a) Write the equation of the line tangent to f at x = −1. (b) Using your answer to part (a), estimate f (0). (c) Using Euler’s method with a step size of 0.5, estimate f (0). (d) Estimate f (0) using an integral.